I'm very happy with this piece. The quality appears nicer than expected. The color is more beige than I expected but I can make that work. The seat is very firm yet comfortable. It's lovely. Elegant and refined, this settee will add a touch of sophistication and classic refinement to your home. The sofa features a rounded back with button-tufted linen upholstery. The turned legs feature a chic grey finish. 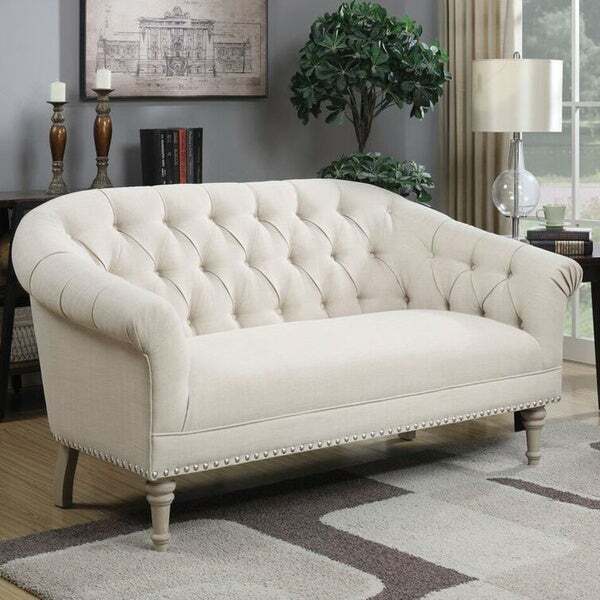 The nailhead trim adds an extra dash of style to this classic settee. Assembly required. This product ships in several boxes. Love this great little accent piece! Adds a nice touch of character. I purchased two of these for my Mothers new apartment. It is small, and regular size sofas would not fit. These were a perfect size. They are placed facing one another and look very sophisticated. She likes that they are neutral so she can dress them up and change the toss pillows with the seasons (Overstock also has toss pillows). She and I both are very pleased with these Settees. In fact, nearly everything purchased for her new apartment came from Overstock. The variety and quality of items combined with customer service made furnishing her new apartment a pleasant experience for both of us. Love this piece and looks perfect in my spot! East delivery! Arrived in perfect condition to my house. No issues what so ever. Thank you Overstock! It’s pretty to look at but so impractical to use. It’s hard and the upholstery slips of the arm rests. I’m always trying to Put the tufts in place. It’s awkward height so I ended up putting it at our breakfast table. This settee is beautiful, but very firm--although comfortable. I wold give it a 4.5 if I could because I still love it. But it would be wonderful if it were somewhat soft. This is a nice looking piece, but there is no comfort- hard with no give. It is in a formal living room, so doesn't get a lot of use. The material looks very cheap and the padding is hard as a rock. It looks good and I really wanted something that was a little dressy to be at a specific place off my living room. Unfortunately no, there is no matching sofa for this. "If,as was previously asked and answered, ""How easy is this to assemble? What tools are needed? Can a70 year old woman do this?" A: The only assembly required is the attaching and screwing on the legs. Overstock Aug 4, 2016 Why is it shipped in several boxes? Please explain." Everything is assembled except the bed. "Is it comfortable for watching TV? I know you said it doesn't swallow you... but wondering if its still comfy for TV viewing with a few pillows around? THANKS"
The settee is a bit stiffer than a sofa/ loveseat, but softens up with more use. "What colors does it come in?" This item only comes in the option shown. "How easy is this to assemble? What tools are needed? Can a70 year old woman do this?" The only assembly required is the attaching and screwing on the legs. "Is this a comfortable sofa or a little stiff?" It's firm and supportive ( better for your back). It's comfortable to sit on or curl up sideways and lie on. The seat component has a little more cushion and give to it than the back and arms do. Fits 2 people with room for another if need be. If you are looking for cozy swallow you up kind of feeling this isn't the one for you. I personally love mine!